The first in a series about United Methodists who are doing extraordinary things. It was a sweltering summer afternoon in South Carolina when 86-year-old widow Delores Howell slipped on some pine straw walking home from visiting a neighbor. Delores tried to get up, but couldn’t. From the ground, she looked back and noticed her hand railing was within sight. She thought if she could drag herself over there, she could pull herself back up. Instead, she injured her shoulder and was bleeding profusely from her foot and elbow, a side effect of her blood thinners. Delores Howell (left) calls nine-year-old Haleigh her angel after suffering a fall. Haleigh comforted Delores, cleaned her “boo boos,” and stayed until medics arrived. 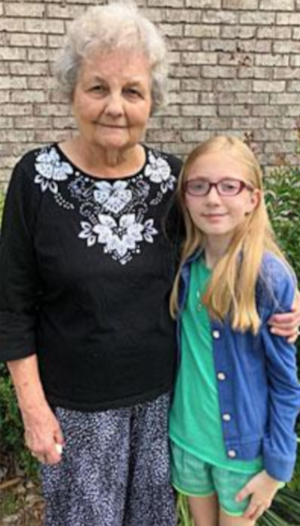 About an hour later on a nearby porch, 9-year-old Haleigh, a member of Central United Methodist Church in Florence, S.C. went outside to let her cat inside and heard a faint cry for help. “I went inside and told Memaw that our neighbor was hurt, and she told me to go over there and see who it was and how bad she was hurt,” said Haleigh. While Haleigh’s grandmother, Martha Schofield, called 911, the nine-year old tended to the patient. “I went back to the house to get cotton swabs and bandaids to clean up the boo-boos as much as I could.” Haleigh gave the dehydrated Delores water and fanned her as medics evaluated her shoulder. “I’m scared of shots and blood, too, but when somebody’s hurt, I really want to help out because I care about them,” said Haleigh. These days, Delores is happily living in a retirement center. And she has regular visitors in Haleigh and Martha, who just last week brought her some fresh strawberries. Do you know any United Methodists who are doing extraordinary things – either as difference makers in their communities or through courageous or selfish acts? To make a nomination, please send a few sentences describing what makes your nominee amazing to presscenter@umcom.org.